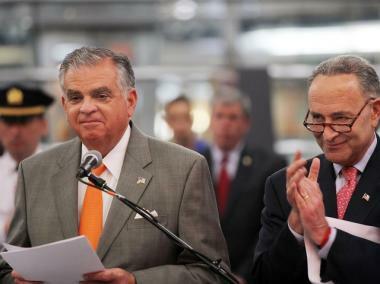 Transportation Secretary Ray LaHood announced the U.S. government has awarded $795 million to increase rail speeds between Boston and Washington. 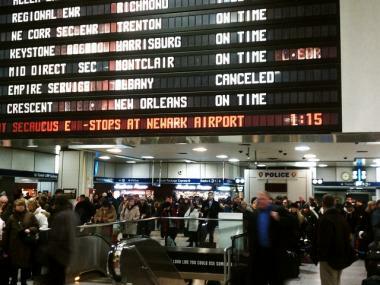 MIDTOWN — New York has been awarded more than $350 million in high-speed rail funding, including new cash to speed trains in and out of Penn Station, federal and state officials announced Monday. Of $2 billion in grants announced by U.S. Transportation Secretary Ray LaHood to "transform travel in America," nearly $300 million will be used to help ease delays in and out of Manhattan by building two new miles of track at the "Harold Interlocking" in Queens, where Amtrak and Long Island Rail Road trains are currently forced to share space. The project is expected to add two new tracks to bypass the "chokehold" rail junction where nearly 800 trains pass through each day, said MTA spokesman Aaron Donovan. The new funding will be used partially to improve train service between New York and Boston. The improvements will also pave the way for new high-speed rail along the route in the future, Donovan said. "New York stands ready to use this federal money to rebuild our transportation infrastructure, expand high speed rail, and put New Yorkers back to work," Gov. Andrew Cuomo said in a statement announcing the grants. "These initiatives have tremendous potential and will be a significant factor in ushering our economy and transportation system into the 21st century," he said. Another $60 million in cash was also awarded to fund projects upstate, including upgrades to tracks, signals and stations along the Empire Corridor, which travels from Penn Station, through Albany, up to Niagara Falls. Sen. Chuck Schumer, a long-time proponent of high-speed rail, said the improvements are necessary for the state. "This historic investment will clear up the spaghetti of confusing lines and signals that slow down travel on the Boston-New York-Philly-DC corridor and make significant upgrades to our upstate rail corridors and out-dated stations," he said in a statement, adding that it will also make the Long Island commute faster and more efficient. In February 2011, Florida rejected $2.4 billion in federal funding, prompting the government to hold a contest to redirect the funds. The governor had also applied for other cash, including $50 million to fund the design of Phase 2 of the Moynihan Station Project and more than $100 million to fund a new signal system between Croton-Harmon and Poughkeepsie. The Obama administration hopes to connect 80 percent of Americans to high speed rail within the next 25 years.